Our Sunday School Program is for grades 3K-6th. We meet each Sunday after the church service at 10:20-11:20 am in the lower level of the church. When new music skills are being learned, we gather right after the church service. The first 20-30 minutes consists of music. We then break into the various age groups. Each group provides age-appropriate methods of teaching by caring individuals. All children of all ages are welcome to learn to play the bells and chimes. We also learn musical skills through singing and movement.
. To sign-up your child, or for more information contact the office at 262-968-2194. 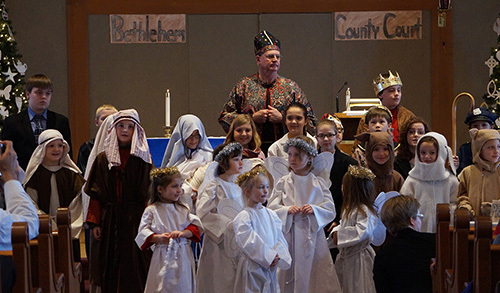 Children perform in the annual Christmas Program during the Sunday church service. This week's project is an "At-Home" learning experience for Sunday School parent and student. The Bible story and work you do together can be handed to me in person, or sent to me by email. The work you do may be used for the children's message in church! This week read Luke 18: 15-17. Draw a picture of Jesus and the children. How old are the children? Where did they all come from? Could one of you be a little one Jesus would love to bless? Write a little story about you coming to Jesus. Tell how you would feel, and what you might say. What does Jesus look like? What would he say and what might he do for you? Where would you be if Jesus came to bless you today? Tell what the word "bless" may mean.